These covers are getting difficult to find because the tablet itself (Google Nexus 7 (2013-2nd Gen)) is now 4 years old. However, we've taken good care of the two tablets we have and they are still working well. So we decided to buy a second Poetic Slimline cover for both tablets. The first ones lasted a full 4 years of heavy use and travel. As for the covers, they fit the tablet perfectly, They wake the tablet when opened, as well as put it to sleep when closed. The tablet is fully protected when the tablet is closed and even when dropped on a corner, a small piece of the cover broke off but the tablet was undamaged. We both like how the cover adds so little to the size of the tablet...Slimline is the right name for this cover. After about 3 years, the magnets came unglued on one cover, so that was easy to fix. At approximately the same age, the outer layer of the other case started to peel off at the places where the case bends most often. A little unsightly, but didn't affect the function at all. Very nice cover and it will last you a long time. 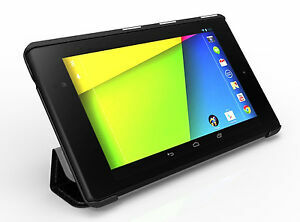 This product does a pretty good job protecting the Nexus 7. I have dropped the tablet a couple of times and there is no visible damage. Also, the rolling cover is pretty handy. My only complaint is that the case feels cheaply made. A small piece chipped off on one of the edges near the buttons. The price was cheap, but the product is "get what you pay for". Not sure how long the case is going to last. I would probably buy something different next time. This is my second one of these. I've tried others. I like to slip it into my back jeans pocket, so the phat ones are out. The other slim types, when folded open, do not lay flat. How irritating that the pad bounces on the fold and is tilted during use! This one lays flat. The "one thing" is that I broke the first one. Yes: by being in my pocket. It cracked around the main camera housing, which is kind thin. Also, the magnets for the closure came out of my first one, but I glued them back in. They are not really needed. Despite these issues, I love this cover. Nice feel. Soft inside. This is the third poetic case I have used on this 2013 tablet. The case takes a beating but lasts a long time (1-2 years each of daily use). It's thin, fits very snug and turns the tablet on and off by opening and closing it. Stays closed via the slim magnets on the side.